So this fudge is pretty much a non-recipe. Heat the milk in a heavy sauce pan on medium heat, stir in the chocolate chips and pinch of sea salt. Stir until the chips are melted and everything is well mixed. Take off the heat and stir in the vanilla extract. Spoon into 8x8 pan. 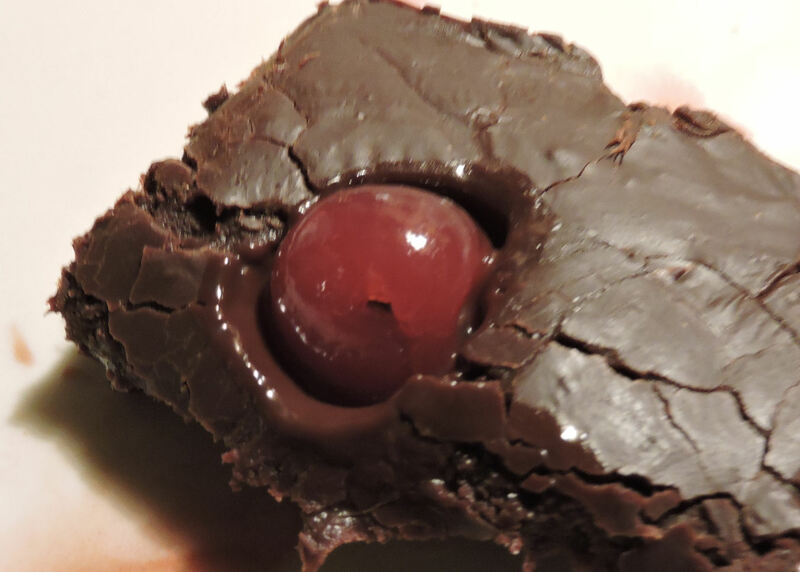 Dot the top with the cherries and cover and chill until set. *Guittard Extra Dark Chocolate Chips are prepared on the same equipment they make their milk chocolate on so there may be a trace of milk in them. There are good completely vegan chips available. I used the Guittard because I love the flavor of them. So I whipped this up, and handed the pan off to my children because apparently you never get too old to "slick the pot" and TG said "This is really good chocolate!" Since she's the chocolate fiend in the family, that is a great endorsement. She wound up sitting there with a bag of open potato chips scraping out the last of the fudge from the pan. Last night, my husband tried a piece and declared it was delicious. I said "TG saw me make it." "Well, that might be dangerous." he responded. From the back corner of the living room we hear her say happily "Yup." I suspect she's going to make a batch with potato chips on top. Disclaimer- I got the Nature's Charm Sweetened Condensed Coconut Milk for free to review. I was not compensated or asked to provide a recipe or review on Don't Eat the Paste. I'm sharing the recipe because it's really, really good and I wanted to.